Apollo’s Fire with founder/director Jeannette Sorrell has won widespread critical acclaim with their half-dozen releases on AVIE. Most recently they released two adventurous albums that explored the byways of historically informed performance practice: early Americana on Come to the River (AV 2205) and ancient Celtic Christmas music on Sacrum Mysterium (AV 2269). 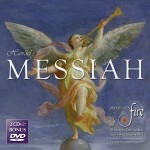 Returning to their baroque roots, they offer a selection of works by Handel that showcases the Apollo’s Fire Chorus. 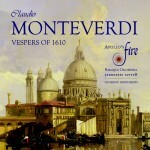 The centrepiece of the album is the grand Dixit Dominus written during the composer’s early days in Rome. 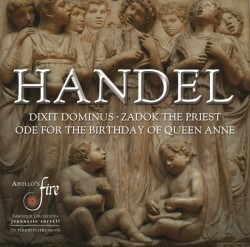 In a gesture to Queen Elizabeth II’s Diamond Jubilee year, Sorrell has chosen two works written for the monarch’s forbearers – the Ode for the Birthday of Queen Anne which celebrated that sovereign’s birthday in 1713, and Zadok the Priest composed for the coronation of King George II in 1727. As a bonus, Sorrell includes “The Lord Shall Reign” from the epic Israel in Egypt.